It has been announced that the first of the two Made in Abyss films will be coming this March. The film which will premiere in Los Angeles on March 15, will include some new scenes. You can take a look at the press release for the premiere below. 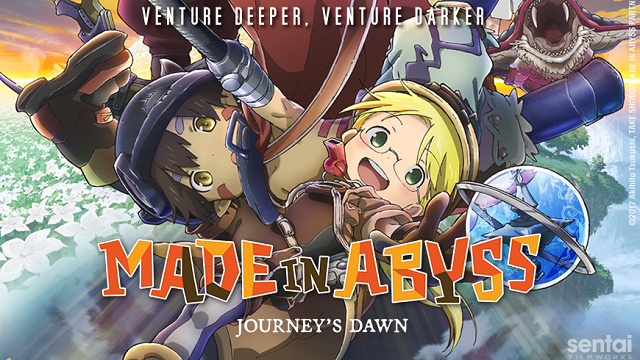 HOUSTON, TX January 22, 2019 – Sentai Filmworks today announced the US debut of the first film in the two-part MADE IN ABYSS compendium, Journey’s Dawn. The film’s premiere is set for March 15, 2019, at Regal Cinema (L.A. LIVE) in downtown Los Angeles, CA. The MADE IN ABYSS television series took audiences by surprise and garnered ecstatic reviews with its disarming facade that shrouded a dark masterpiece. Now, the timeless story is presented in theaters with newly added scenes and storytelling. Sentai Filmworks will host a red-carpet event coinciding with the premiere with numerous special guests including famed director Masayuki Kojima, composer Kevin Penkin, music producer Hiromitsu Iijima, and producer Shimpei Yamashita. The enigmatic Abyss is an unforgiving and deadly place. Despite the dangers, it still captures the imagination of explorers such as Riko who wishes to follow in her mother’s footsteps and trains hard to become a Cave Raider. One day, she receives news that her mother died in the Abyss, yet a mysterious note tells Riko that her mother may still be alive. Vowing to uncover the truth about her mother’s fate, Riko embarks on a journey with a humanoid robot boy name Reg. Together, they will discover if they have what it takes to survive where so many others have perished. Information regarding both the movie and ticket sales for the Los Angeles premiere are available at https://www.madeinabyssmovies.com/. The Made in Abyss anime can be watched on HIDIVE and Prime Video.